I’ve written before about the wonderful Chicago initiative “Untold Stories,” which features Palestinians sharing their personal stories of their lives under occupation. While it began as a project of my congregation, it has since expanded to become an interfaith community effort. I’m so gratified by the success of this program, which draws upon the unique power of narrative rather than political rhetoric. As ever, the simple sharing of stories has an uncanny ability to cut through the convoluted complexities of political issues like little else. Up until now, “Untold Stories” has featured Palestinian-Americans (and recently, the addition of Israelis as well.) 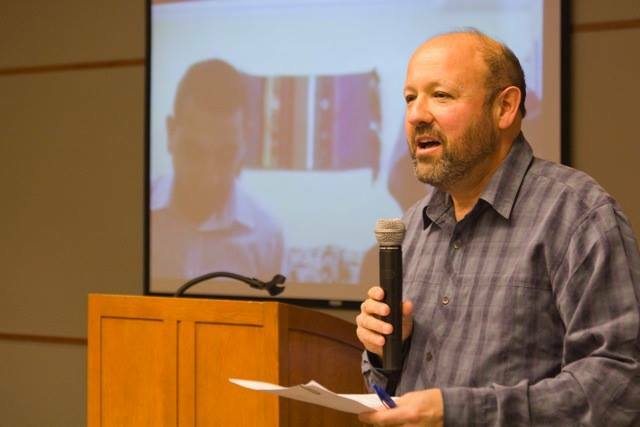 This past Sunday, however, for the first time participants were able to hear from Palestinian presenters speakers speaking to us directly from Palestine. 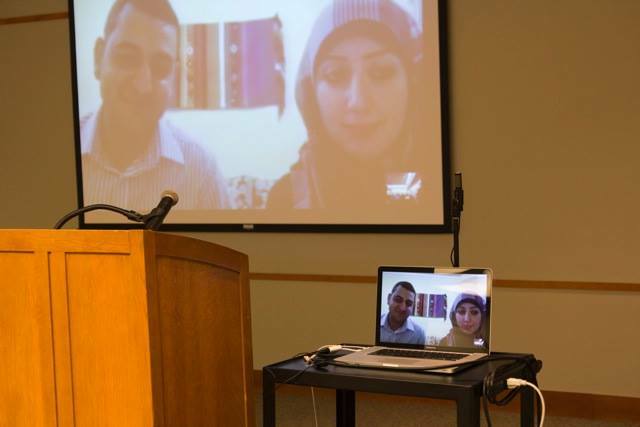 I was honored to serve as the facilitator of a Skype conversation between attendees at the Evanston Public Library and a young Palestinian couple in Gaza: Ayman Qwaider, a community educator and peace activist and his wife Sameeha Elwan – a blogger/student/activist. For well over an hour, Ayman and Sameeha shared details of life inside the Gaza blockade. Ayman, 26, received his degree from the Islamic University of Gaza in 2008, after which he worked for two years as an international humanitarian aid worker. In 2010, he was granted a scholarship to travel to Spain, where he received his master’s degree in Peace, Conflict and Development Studies. He currently works for a non-governmental organization in Gaza. Sameeha is a talented writer and blogger who, like Ayman, received her BA at the Islamic University, then received a scholarship to earn an MA in Culture and Difference at Ustinov College in Durham, UK. Her work is featured in the important new anthology, “Gaza Writes Back,” recently published by Just World Books. Sameeha has received a scholarship to pursue a Phd in English literature but it is as yet unclear if she will receive permission to travel once again pursue her studies. It was clearly important for Ayman and Sameeha to be able to share their stories with us, particularly since the plight of Palestinians in Gaza is the chronically forgotten story in the Palestinian-Israeli conflict. Now six years into this blockade, Gazans still live in a virtual open-air prison with severely curtailed access to the most basic necessities of living. As Ayman and Sameeha told us, 80% of the population is dependent on international aid, the economy has all but collapsed, the percentage of children suffering from malnourishment is rising, unemployment is at 60%, there is a shortage of drinkable water and access to electricity is limited to several hours a day. To drive this point home, Ayman told us at the beginning of the program that we should expect their electricity to go down in one hour. At that point, we would need to wait for a few minutes while they hooked their computer up to a reserve battery. When we reconnected, they were sitting in the darkness of their Gaza City flat, their faces illuminated only by the light from their computer. (Compare top pic with the pic above). I’ve written extensively about the politics dimensions of the Gaza crisis so I won’t belabor the point here. 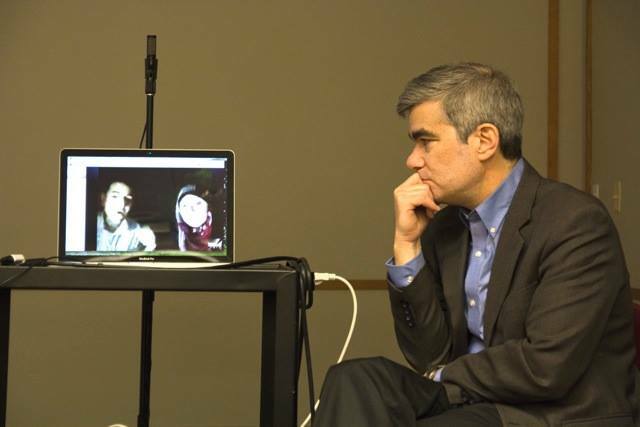 I will only say that I am deeply grateful to “Untold Stories” (and its coordinators, Sallie Gratch and Mark Miller) for enabling us to hear Ayman and Sameeha’s story – and help us bear witness to this injustice with a unique kind of power. It’s truly difficult to describe how it felt to converse with a young couple who were sitting in the darkness of their apartment from inside a blockaded strip of land while we sat in the comfort and freedom of an Evanston library. It is so very, very important to hear these untold stories and to create real relationships with those who are living them out day after day. I’d add it is even more important to view ourselves as an integral part of these stories, so that we might somehow participate in their just resolution. Some links I encourage you to read: click here to read Ayman’s blog and here to read Sameeha’s. Click here to read an excellent article by journalist Ruth Pollard which describes the current reality under the Gaza blockade and prominently features Ayman and Sameeha’s story. And finally, click here to donate to ANERA – a heroic NGO that has long been endeavoring to provide sustainable support to the people of Gaza. This entry was posted in Gaza, Human Rights, Interfaith, Israel, Palestine, Refugees on March 10, 2014 by Rabbi Brant Rosen. I think this is a great initiative and would like my congregation Tikkun v’Or to participate as well. I will be forwarding your blog to them to open the discussion. Small world! Sameeha is a very close friend of mine. You may have seen her pop up on my blog from time to time. I wrote about her here during Pillar of Defense: http://972mag.com/cut-off-from-everywhere-when-gaza-feels-like-another-world/60021/ . I’m glad that you were able to ‘meet’ her if only virtually. She’s a formidable woman. I’ve never met Ayman (I couldn’t get authorisation to enter Gaza for the wedding, despite our best plotting) but hopefully one day. Interesting story indeed. But I have a question: if the electricity went out in the apartment how are they able to continue talking on Skype? I understand that computers require electricity. Not to mention Internet Also requires electricity.